Can you get more than one person to open my subject tracking sheet? 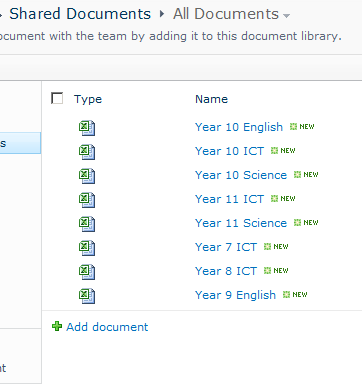 Having spent many years in schools there has always been a question that has been asked by a member of the teaching staff, ‘Can you get more than one person to open my Excel tracking sheet at the same time?’. 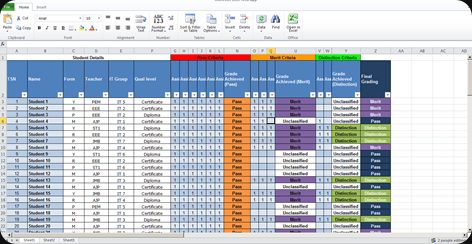 Most schools will have Excel spread sheets that have information about pupil estimated grades, predicted grades and other information around their students work. They will mainly have one for each class in their department and spend a lot of time filling in cells on the pupils marks. The main issue over the years has been that only one member of staff has been able to modify an Excel spread sheet at a time, locking out the file until they have closed it then allowing another member of staff to add any of their data. 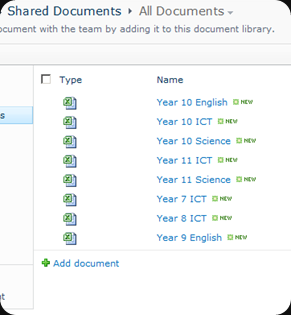 This has resulted in each teacher creating their own tracking sheet per class they teach so they don’t have to worry about others using and locking the file out. Speaking to Heads of Department and subject leaders they have always wanted to be able to see how students are doing across their department and opening several to a hundred spread sheets can become very annoying, time consuming and you don’t get a rough idea of how the pupils are really doing. Having been asked the same question over the last 10 years and giving the same answer there is now a answer to one of the biggest IT questions in schools! In the new release of Office 2010 and Office Web Applications a new feature has been added called ‘co-authoring’ allowing multiple users have access and modify the same Excel file at the same time. In previous versions of Microsoft Office when a user is modifying a file it would lock the whole file out to everyone else but in Office 2010 this has changed. Taking a tracking sheet as an example. 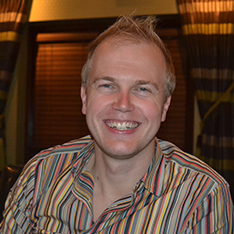 In Office 2007 and below when a member of staff opened the tracking sheet in Excel they would open the whole file. Locking the file so only one user can open it. If another member of staff tried they would get an error message. The same as the message at the top of this blog post. In Office 2010 things have changed. keeping to our tracking sheet as an example, when a user opens a spread sheet it doesn’t lock the file, it still allows other users to connect. 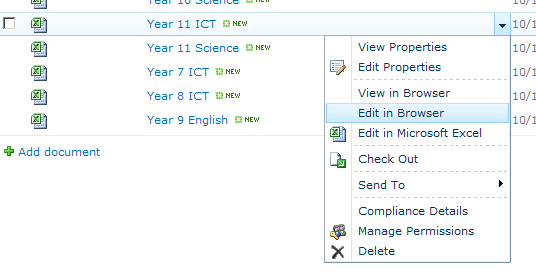 Even though the first member of staff has opened the fie and modifying cells another member of staff can open the file and edit other cells. In Excel 2010 instead of locking the whole spread sheet it only locks the individual cell that the member of staff is using, allowing other members of staff to add data in other cells and other sheets within the spread sheet. Here is a Excel tracking sheet I have for my demo school called New Wave Academy. The data holds information on all my pupils in the same year group and the subject is ICT for their certificate/diploma course. 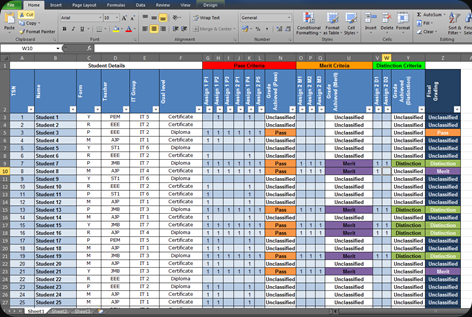 The spread sheet has loads of formula based cells and as I fill in more information different cells change to say if the pupil is achieving a Pass, Merit or Distinction. 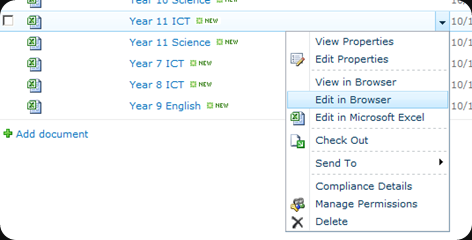 It also has some conditional formatting allowing me to see the status of grades via a colour scheme. 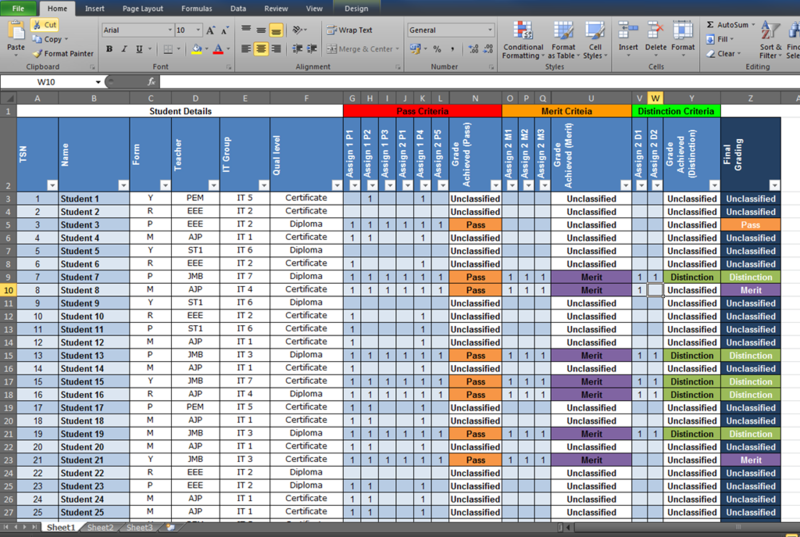 I’m now going to upload this Excel spread sheet to my SharePoint 2010 based Learning Platform. I can now select the tracking sheet I want to open and from properties list you will see that it says ‘Edit in Browser’. When opening the spread sheet in the browser it looks very similar as it did in the full fat client. What we can see in the bottom right hand corner of this web page is ‘1 person editing’ and if we click on this we can see that 1 user is editing the file (myself – the System Account). I’m now going to get another user to do the same and open this spread sheet in their web browser. In the bottom right hand corner I now see it says ‘2 people editing’ this file and when I click on it I get a list of all the users connected and editing. So I’m now changing the file as well as my friend and the changes they make are replicated to my screen and the same is happening to them. All the changes are saved straight away and my colour scheme is kept up to date. Nice feature, it’s about time!